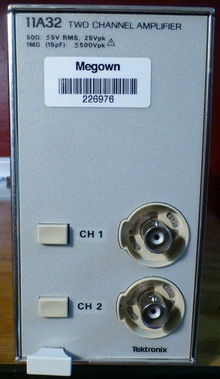 The Tektronix 11A32 is a 400 MHz dual-channel amplifier plug-in for 11000-series scopes. It uses the M377 amplifier chip. The fine steps between the deflection ranges are calibrated in 1% increments. The 11A32 uses the same firmware as the 11A34. The 11A32 uses an 8052 microcontroller and a DS1120 NVRAM. This page was last edited on 5 April 2019, at 17:23.